We will draw up a floor plan of your new residence which will enable us to determine which items we will pack for your move. 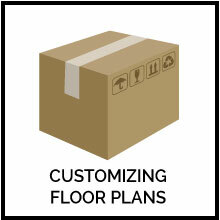 With the floor plan, you can see how all of your prized possessions will fit into your new home. The pre-designed floor plan makes your move flow smoothly. The Dragon Design, LLC Team will work with you one-on-one to organize each room in your home and help categorize your belongings. Maybe you’d like your son to have your Hummel collection or your daughter to have your doll from Paris…whatever it is, we’ll make sure nothing is left behind and all your requests are honored. We will then disperse all remaining items via charities, auction services and on-line sales companies, per your request. Dragon Design, LLC can help you get your home prepared for sale in record time, so you can ensure you receive top dollar and solicit a quick sale. Please visit the section on our website dedicated to Home Staging! We will handle your belongings with the as if they were our own. Dragon Design, LLC can pack you home quickly. Everything will be labeled and coordinated based on its new location in your new home. The movers will be lined up and upon arrival, if it’s a more local move, Dragon Design, LLC can unpack your new belongings too! If we are not able to unpack you, we can find a CRTS (link to www.moveseniors.com) or NASMM (link to www.nasmm.com) member near you, who has been trained just as we have. They will aid in finishing your move! Dragon Design, LLC understands how important it is to feel settled as quickly as possible. Between all team members involved with Dragon Design, LLC we have moved, ourselves, over 25 times in a 10 year time span. Our goal is to have you settled in no time, so you begin the fun part.…the decorating process! Finally! You are all settled! Now it’s time to decorate. Please visit our section on the various Design Services we can offer any of our clients! Work with Probate to Get the Home Staged and the Property Listed for Sale, (so it will settle quickly & sell for top dollar). We will work with the Executor, Executrix or Administrator of the Will in conjunction with the Estate’s Attorney to accomplish all of this in a timely, respectful manner.